Excavations at Western Wall Plaza unearth unique stamped clay from the First Temple Period believed to belong to city governor. A unique stamped piece of clay from the First Temple Period, inscribed in ancient Hebrew script, was unearthed in the Israel Antiquities Authority (IAA) excavations in the Western Wall Plaza in Jerusalem. The important find was discovered over the course of the IAA’s excavations at the site, carried out in cooperation with the Western Wall Heritage Foundation. According to the excavator, Dr. Shlomit Weksler-Bdolah, "the Bible mentions two governors of Jerusalem, and this finding reveals that such a position was actually held by someone in the city some 2700 years ago." This extraordinary find is a lump of clay, stamped and pre-fired. It measures 13x15 mm and is 2-3 mm thick. The upper part of the sealing depicts two figures facing each other, and the lower part holds an inscription in ancient Hebrew script. The seal was presented to Jerusalem Mayor Nir Barkat, during his visit to Davidson's Center, near the Western Wall, last week. After the completion of the scientific research, the seal will be displayed temporarily in the mayor's office. 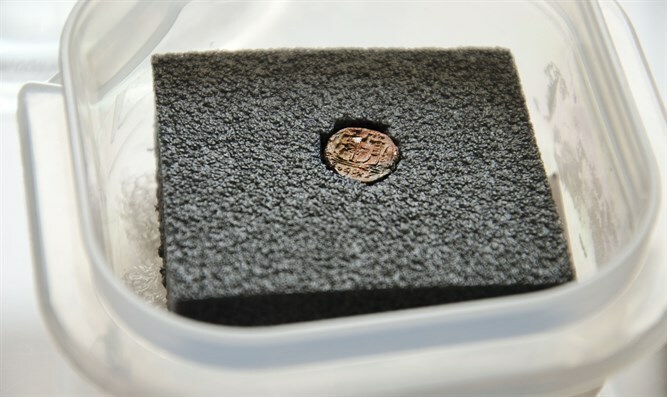 The seal, its use unknown, was retrieved by Shimon Cohen while wet-sieving the soil from a late First Temple-period building (seventh-sixth centuries BCE). Speaking on behalf of the IAA, Weksler-Bdolah said she believes that "the seal had been attached to an important transport and served as some sort of logo, or as a tiny souvenir, which was sent on behalf of the governor of the city." "It is likely that one of the buildings in our excavation was the destination of this transport, sent by the city governor. The finding of a seal with this high-rank title, in addition to the large assemblage of actual seals found in the building in the past, supports the assumption that this area, located on the eastern slopes of the western hill of ancient Jerusalem, some 100 m west of the Temple Mount, was inhabited by highly ranked officials during the First Temple period. "This is the first time that such a sealing is found in an authorized excavation. It supports the biblical rendering of the existence of a governor of the city in Jerusalem 2700 years ago." Hebrew University's Professor Tallay Ornan and Tel Aviv University's Professor Benjamin Sass, studied the sealing and describe it as follows: "Above a double line are two standing men, facing each other in a mirror-like manner. Their heads are depicted as large dots, lacking any details. The hands facing outward are dropped down, and the hands facing inward are raised Each of the figures is wearing a striped, knee-length garment. In the register beneath the double line is an inscription in ancient Hebrew, with no spacing between the words and no definite article." "The inscription denotes 'lesar ha'air,' or 'belonging to the governor of the city.' The title 'governor of the city' is known from the Bible and from extra-Biblical documents, and refers to an official appointed by the king. Governors of Jerusalem are mentioned twice in the Bible: in 2 Kings, Joshua is the governor of the city in the days of Hezekiah, and in 2 Chronicles, Maaseiah is the governor of the city in the days of Josiah." "It is very overwhelming to receive greetings from First Temple-period Jerusalem," Barkat said upon seeing the seal. "This shows that already 2700 years ago, Jerusalem, the capital of Israel, was a strong and central city." "Jerusalem is one of the most ancient capitals of the world, continually populated by the Jewish people for more than 3000 years. "Today we have the privilege to encounter another one of the long chain of persons and leaders that built and developed the city. We are grateful to be living in a city with such a magnificent past, and are obligated to ensure its strength for generations to come, as we daily do." According to Dr. Yuval Baruch, IAA Jerusalem District archaeologist, "The finds' outstanding significance has caused us to decide to conserve the First Temple-period building found in the Western Wall plaza excavations, and open it to visitors." Conservation work at the site, on behalf of the Israel Antiquities Authority, was carried out by Yossi Vaknin and Haim Makuriya.